Cheers to a New Year! Join us and celebrate! We are so grateful for such an amazing 2018 at House Wine and want you to all join us as we celebrate you! 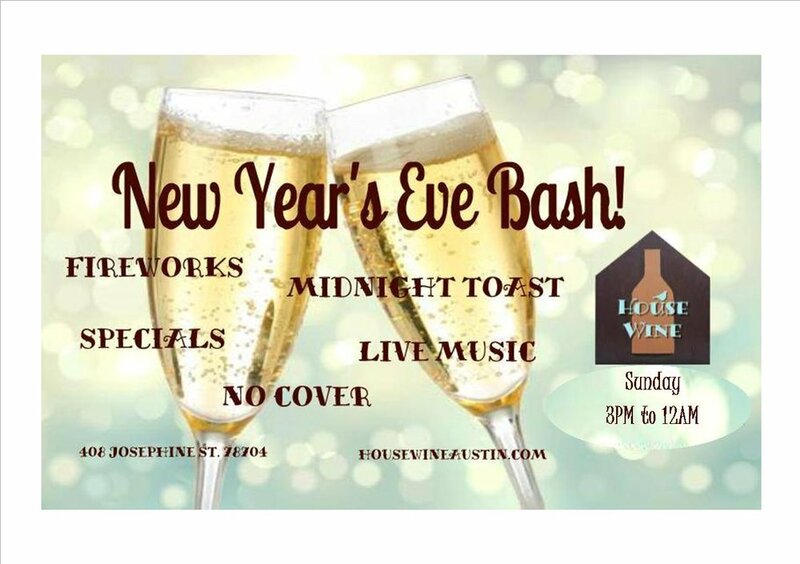 We will have Live Music by Young Will from 9-Midnight, a perfect view of Auditorium Shores Fireworks Show at 10pm, and a Midnight Toast! No cover! YOU'RE INVITED TO OUR HOLIDAY SIP & SHOP! We are located at 408 Josephine Street which is a short walk to the festival. We have parking spaces available for $35/day with no re-entry, or purchase VIP parking for $70/day that allows you to come and go. We are excited to be your ACL Homebase! We have Late Night Pizza, Frosé and $7 Daily Happy Hour Specials on snacks and wine! Check out our Menu! Have you seen our updates? Come grab a glass and check out our new look! Best Seat to View Fireworks over Lady Bird Lake! Celebrating 10 years of wonderful memories with our favorite Wine Lovers! Join us for an ALL DAY Rosé Anniversary Party! $35 tickets include 5 rosé tastings, snacks and great company! We will be pouring all of our delicious rosés, an extra special Frosé with perfectly paired snacks ~ALL WITH BABY GOATS! Meet this talented woman winemaker and taste her gorgeous wine produced in Salento, Puglia. Qu.ale is silky smooth and richly rewarding. Qu.ale is three things - a play on the dynamic winemaker Alessandra Quarta’s name, Italian for ‘what,” and the answer to the question of which bottle of wine do I want for a casual weeknight dinner. If that weren’t enough, each purchase of Qu.ale ensures a donation to the Salina Monaci nature preserve - home of Puglia’s famous Pink Flamingo’s. Join us to taste these amazing wines! We will have free wine tastings from Raventos, a world renowned Spanish winemaker, Live Music 7-10pm, and drink specials! Friday Happy Hour! Complimentary Rosé and Nibbles with musical stylings by Cellist, Randall Warren! This Friday, 6-8pm! Come enjoy your first glass on us! We will be pouring a gorgeous 100% Gamay Rosé from Savoie, France and serving some delicious snacks. Stay for a flight or pick out a glass from our rotating wine list and finish the evening with one of our delicious desserts. This month we have another special guest hosting the pick-up party and tasting us on some exciting French wines! We will explore the regions and taste exquisite wines selected by a House Wine favorite industry expert! We are also offering exclusive discounts on our weekly Spy House Tastings when you become a Wine Geeks Club Member! 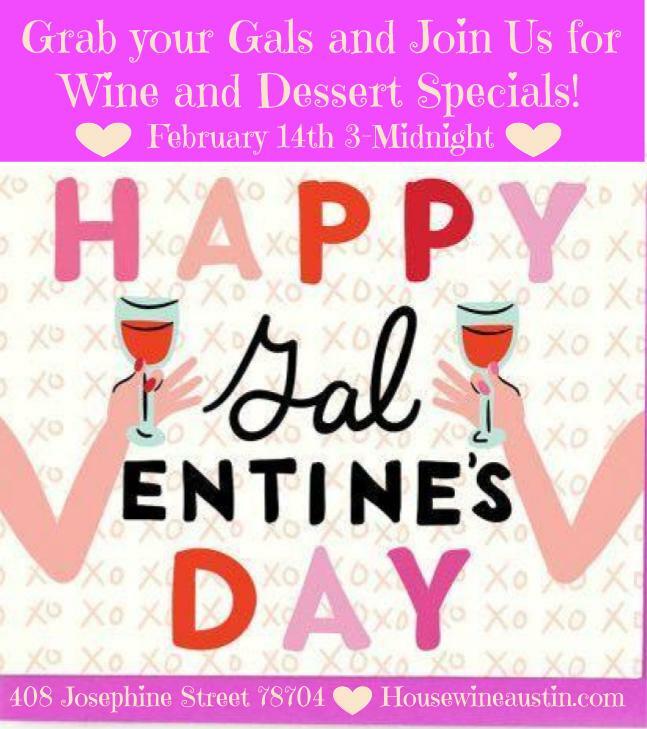 We hope you'll join us and taste some amazing wine! 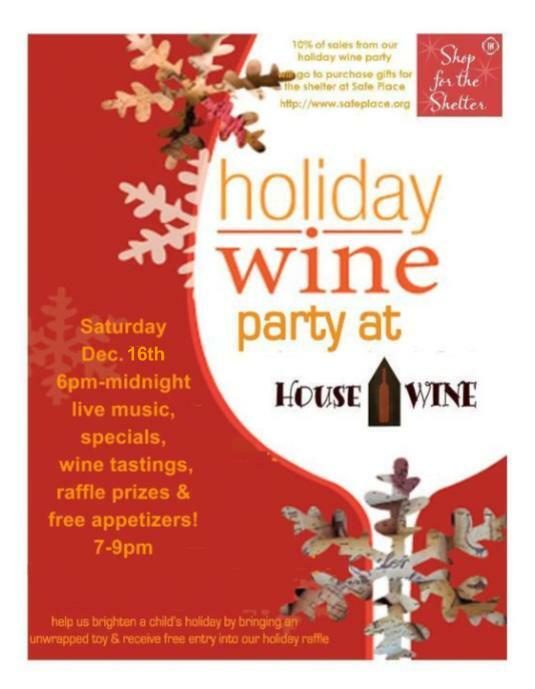 Join us at House Wine for a Montinore Estate Wine Tasting Event this Saturday 3:30pm-5:30pm! Established in 1982, Montinore Estate is the second largest producer of wines made from Biodynamic® grapes in the country. With our 200-acre Demeter Certified Biodynamic® and Stellar Certified Organic estate vineyard located in north Willamette Valley in Oregon, we focus on producing superior Pinot Noirs, cool climate whites and fascinating Italian varietals.